What does the Serial-UDP adapter do? What does the Serial-to-UDP adapter do? The Serial-to-UDP adapter (or just Serial-UDP) translates serial port data into UDP/IP network packets and sends them over any standard ethernet network. It also receives UDP/IP packets from the net and routes the data through the serial port. In essence, the board allows an ordinary serial device to communicate via ethernet. Two boards together can create a virtual serial link where all the data passes over an ethernet network, instead of the usual serial cable. Serial-UDP uses standard UDP/IP packets to pass all data and control signals. Therefore, the adapter can be used with almost all standard networking equipment including routers, bridges, switches, wireless LAN devices, etc. Controlling and monitoring serial devices via a network (and/or via network software). Reprogramming Parallax BasicStamp processors remotely. Overcoming RS-232 cable length problems by passing serial data over ethernet. Adding serial ports to computers that have none. 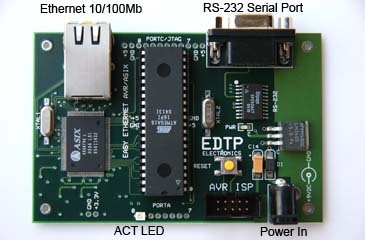 Serial-UDP is built from a modified EasyEthernet/AVR board from EDTP Electronics. It uses an Atmel AVR ATmega16 processor to handle the ethernet interface, network protocols, and serial I/O. Accepts 7-12VDC @ 150mA to power the Serial-UDP board. Using 9VDC is preferred to keep regulator from getting hot. Set the terminal program to 115200 baud, 8 bits data, No parity, 1 stop bit (115200,8,N,1). You should see the boot-up messages appear. Press [ESC] key three times when prompted. Type '?' and [ENTER] to see available commands. Use the 'x' command to save settings and exit config mode. Serial-UDP will reboot with new settings. This is the IP address assigned to the Serial-UDP adapter. It must be a valid IP address for the network on which the adapter operates. For private/isolated networks, use IP addresses in the range 192.168.x.x. The netmask for the network on which the adapter operates. Often this is 255.255.255.0. The IP address of the router or gateway on the local network. The IP address where serial data should be sent. This may be another Serial-UDP adapter that forms a complete serial-to-ethernet-to-serial bridge, or a computer that will process the serial data itself. The baud rate used for general operation. Note: Boot-up messages are always sent at 115200bps. If this many characters are received over the serial port, they are immediately sent over the network. This will override the timeout. If this amount of time goes by with no new characters received over the serial port, then the data already received is sent over the network. Configure two Serial-UDP adapters with valid IP/Netmask/Gateway for your network. Each adapter should have it's own IP address. Set the "DestIP" of each adapter to be the IP address of the other unit. Connect one Serial-UDP adapter to your computer with a standard 9-pin serial cable. Also connect this adapter to your network. Connect the other Serial-UDP adapter to your BasicStamp hardware. 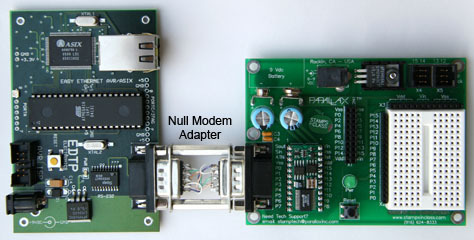 You will need a 9-pin male-male null-modem cable or null-modem block to make the connection (such as shown in photo above). Also connect this Serial-UDP adapter to your network. Open the BasicStamp Editor on the computer. Click the icon to ID the connected BasicStamp. The Serial-UDP adapters will blink a few times and your Stamp should appear connected. If the ID succeeds, proceed as you would if the Stamp were directly connected to your computer. Try limiting the number of COM ports that are searched in the ID process (select just one). Try connecting the BasicStamp directly to the computer. Does that work?